This whimsical ornament from Danji is perfect for your dog. It is handpainted onto 18 mesh needlepoint canvas. 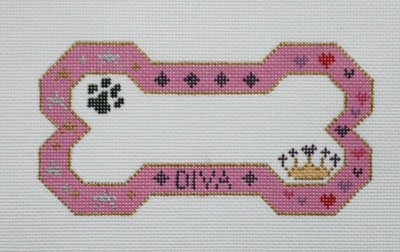 The Diva Bone ornament measures 3" x 6". If you require stretcher bars we recommend a pair of 7" and a pair of 10" bars and some thumb tacks. This whimsical bone needlepoint is sold canvas-only or with threads. We use Pepper Pot single ply silk, Bella Lusso for wool, and DMC embroidery floss if cotton is selected. The needlepoint canvas usually ships in a few days. You can always check availability before you order.